Three years ago Josh Allen, Devin Schoening, and I set out to start a podcast. Dads in Ed was born. We had converged on each other with the idea of using Google Hangouts on Air to record conversations about things we were passionate about and using that audio to make a podcast. The things we were collectively passionate about included: being dads, loving sports, educational technology, education as a whole, being dads in education, and talking about current events. The true crux of the show was going to be about how being a dad in education, perhaps with your child in the same school system that you worked, and how we handle this sometimes delicate landscape. This became a staple question we have asked all of our guests. How has being a parent and also an educator impacted you as an educator? Another major part of the show was going to be about bringing smart people on the show to talk. We would invite guests, most the time dads in education like us, but sometimes even moms or famous writers for newspapers. Typically the connection to the guests has come through one of us, or all of us, and our PLN. Three years later we have had 60 guests come on the show! Guests have been from all over the United States and some from Canada as well. We truly have interviewed some amazing people who do fantastic things in education! We are very proud of the content we have published and excited to see how the show continues to evolve. One thing we have always said was that we never cared if anyone listened or watched the LIVE show, that is was never about the numbers of that for us. We simply enjoyed getting together to “talk shop” about the things we were passionate about and utilize our PLN to interview great minds in education who typically happen to be dads in education like us. What is cool is how some people have listened to the podcast or watched the LIVE show, and quite honestly, there has never been an episode that I did not learn something new or get inspired by one of the guys or guests, and for that, I am grateful. Shouldn’t we all want to be lifelong learners? Isn’t that what we want to teach our kids? 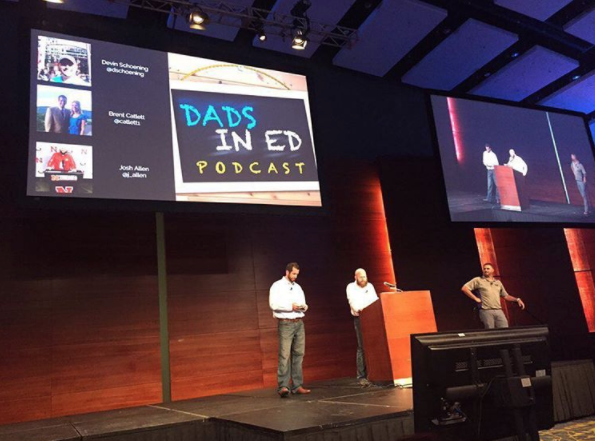 #dadsined is also proud of being a member of the Education Podcast Network. 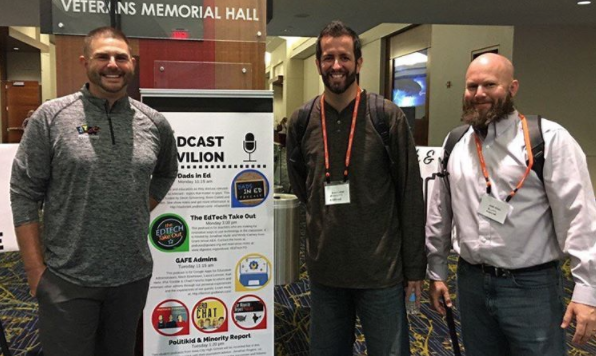 This network is an amazing group of educators that are publishing content on their podcasts as well, and I highly encourage you to give them a listen. I know for me, this journey has yielded a new type of learning by listening to other podcasts. I subscribe to many great podcasts like the House of Edtech by Chris Nesi, The Wired Educator by Kelly Croy, The Creative Classroom by John Spencer, Principally Speaking by Jason Bodnar, and much more! Personally, I often listen in my car as I travel about the city and school district from one building to another, or sometimes when I take road trips. I love that I can pass my time in the car with something meaningful that I am passionate about EDUCATION! So congrats DadsinEd on three years and 60 episodes! Thanks, Josh and Devin for letting me be a part of this journey with you. I have thoroughly enjoyed the ride and look forward to what we come up with for the future.